On this day in 1952, Sam Phillips started the record label that launched careers for so many legends. 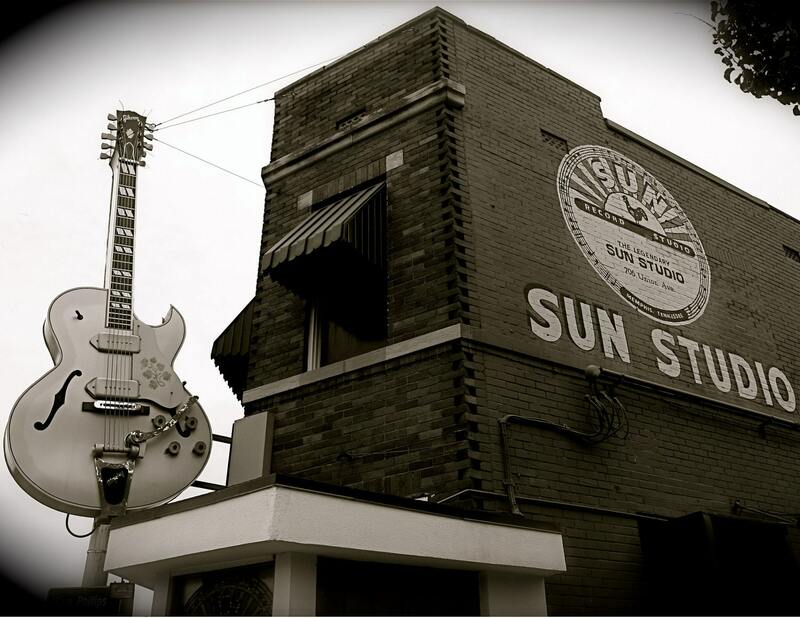 61 years later, Sun Records is as iconic as ever. Happy Birthday, Sun! I loved trying to collect these but now after all these years, they still turn up at record fairs. Sun Records is a record label founded in Memphis, Tennessee, starting operations on March 27, 1952. Founded by Sam Phillips, Sun Records was notable for discovering and first recording such influential musicians as Elvis Presley, Carl Perkins, Roy Orbison, Jerry Lee Lewis and Johnny Cash. (Presley’s recording contract was sold to RCA Victor Records for $35,000 in 1955 to relieve financial difficulties which Sun was going through.) Prior to those records, Sun Records had concentrated on recording African-American musicians, because Phillips loved Rhythm and Blues and wanted to bring black music to a white audience. It was Sun record producer and engineer, Jack Clement, who discovered and recorded Jerry Lee Lewis, while owner Sam Phillips was away on a trip to Florida. The original Sun Records logo was designed by John Gale Parker, Jr., a resident of Memphis and high school classmate of Phillips. Sun was founded with the financial aid of Jim Bulliet, one of many record executives for whom Sam had scouted artists before 1952. The music of many Sun Records musicians helped lay part of the foundation of late 20th century rock and roll, plus it influenced many younger musicians, particularly the Beatles. In 2001, Paul McCartney appeared on a tribute compilation album titled Good Rockin’ Tonight: The Legacy Of Sun Records. The 2010 tribute Million Dollar Quartet is based on the famous photograph of Carl Perkins, Johnny Cash and Jerry Lee Lewis grouped round Elvis Presley at the piano, the night when the four joined in an impromptu jam at Sun Record’s one-room sound studio, the “Million Dollar Quartet” of 4 December 1956. In 1969, Mercury Records label producer Shelby Singleton purchased the Sun label from Phillips. Singleton merged his operations into Sun International Corporation, which re-released and re-packaged compilations of Sun’s early artists in the early 1970s. It would later introduce rockabilly tribute singer Jimmy “Orion” Ellis in 1980 as Orion taking on the persona of Elvis Presley. The company remains in business today as Sun Entertainment Corporation, which currently licenses its brand and classic hit recordings (many of which have appeared in CD boxed sets and other compilations) to independent reissue labels. 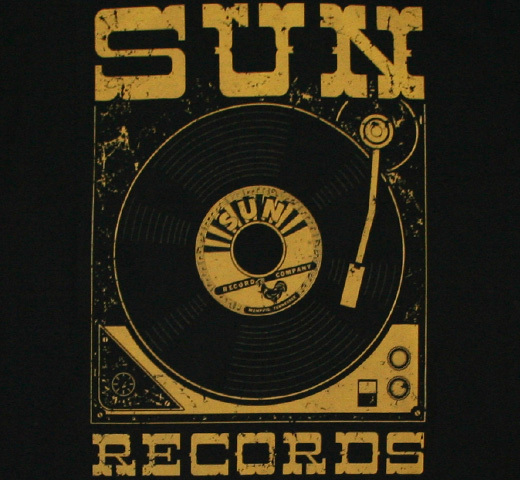 Sun Entertainment also includes SSS International Records, Plantation Records, Amazon Records, Red Bird Records, Blue Cat Records among other labels the company acquired over the years. 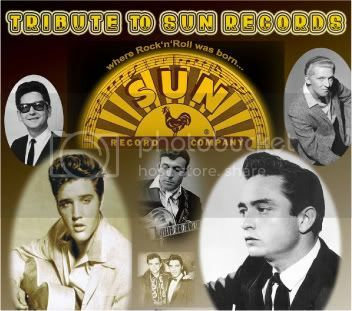 Its website sells collectible items as well as compact discs bearing the original 1950s Sun logo. Some of the notable recording artists at Sun were Roscoe Gordon, Rufus Thomas, who recorded solo and with his daughter Carla Thomas, Little Milton, Jerry Lee Lewis, Carl Perkins, Johnny Cash, Elvis Presley, Roy Orbison, Charlie Rich and Conway Twitty (who at that time recorded under his real name of Harold Jenkins). The Lovin’ Spoonful song “Nashville Cats” erroneously refers to “yellow Sun records from Nashville”. If you have not heard of this Label, then here is something of a bibliography to try and explain it for you. Sam C. Phillips was from Florence, Alabama. He had ambitions to be a lawyer, but had to drop out of high school to support his aunt and widowed mother. He became a disc jockey in 1942 at WLAY in Muscle Shoals, Alabama. After a series of jobs on other radio stations, he ended up on WREC in Memphis, Tennessee, in 1946. He was also promoting events at the Hotel Peabody in Memphis, and by 1950 had enough money to start a company to record local events and do custom recording. The company he formed was called Memphis Recording Service, with a small recording studio at 706 Union Avenue in Memphis. He developed contacts with Saul and Jules Bihari who owned Modern Records in Los Angeles and Sam’s first recording was of Phineas Newborn, a jazz pianist, for them in June 1950. A disc jockey on WHBQ named Dewey Phillips (no relation to Sam) came to Sam with the proposal to form a record label to record the many blues singers in and around Memphis. Dewey Phillips would run the label and Sam Phillips would record the music. The name of the record label was “It’s The Phillips” The first and only record issued was It’s The Phillips 9001/2, “Boogie in the Park”/”Gotta Let You Go” by Joe Hill Louis in August 1950. The record was unsuccessful, and Sam Phillips subsequently negotiated a contract with Modern Records for Joe Hill Louis recordings. Phillips continued working for Modern Records, cutting sessions for B.B. King, Rosco Gordon and Walter Horton. In 1951, he also started an association with the Chess Brothers in Chicago. After recording Howlin’ Wolf and Jackie Brenston, he offered to lease the masters to Chess. Modern Records was upset that Phillips had given Chess the first option on Brenston and Wolf recordings and after that used virtually nothing from the Memphis Recording service. Jackie Brenston was a saxophone player in Ike Turner’s Kings of Rhythm band. Ike Turner had come to the Memphis Recording Service to record an automobile song he and the band had developed called “Rocket 88”. Sam Phillips leased the song to Chess records, where it was issued under the name “Jackie Brenston and His Delta Cats.” It became one of the biggest R&B hits of 1951. When many of the bluesmen that Phillips had been recorded migrated to Chicago and started recording with Chess Records directly, the Chess brothers also stopped using masters made by the Memphis Recording Service. The fact that he was unsuccessful in getting the material he was recording out through other record companies led Sam Phillips to start his own label. 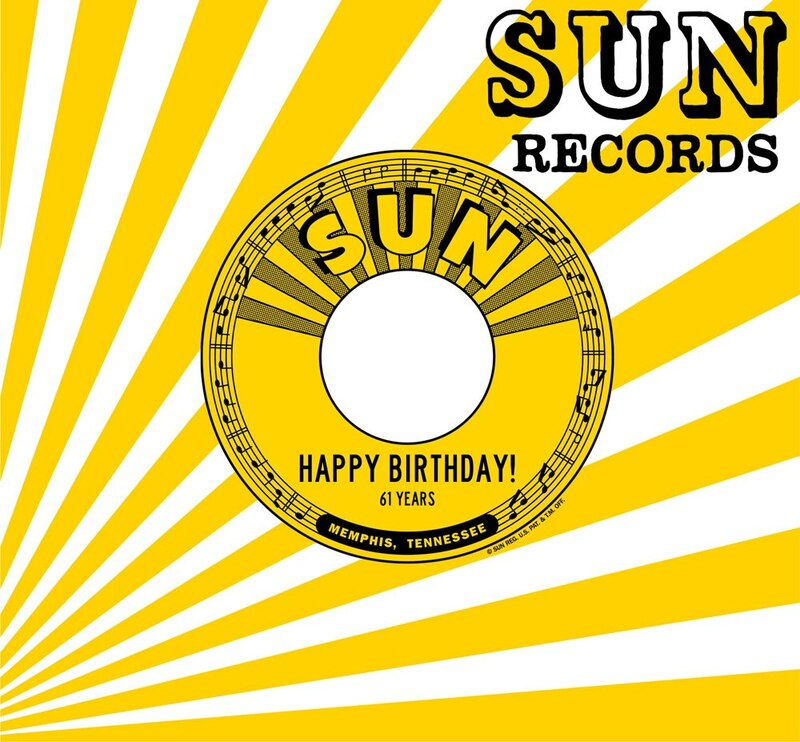 Sun Records was born in February 1952. Sam’s brother Judd Phillips joined the company to handle promotion. Judd had been involved in country music promotion with Roy Acuff before moving to California to work on radio station publicly for Jimmy Durante. Judd knew how to get product exposure on radio. Judd eventually left Sun Records and had a short-lived label himself called Judd Records. He was manager for Jerry Lee Lewis for many years. The first record on Sun was to be number 174 by “Little Walter” Horton and Jack Kelly titled “Blues in My Condition” [billed as by “Jackie Boy and Little Walter”] but a negative reaction to samples circulated to radio stations persuaded Phillips not issue the record commercially. Sun 175 by Johnny London titled “Drivin’ Slow” was the first record to appear in record stores. A local disc jockey on WDIA named Rufus Thomas had the first hit on Sun with a recording of “Bear Cat” (Sun 181) which was an answer record to Big Mama Thorton’s popular R&B hit “Hound Dog”. The success of “Bear Cat” and the follow-up “Tiger Man” (Sun 188) enabled Phillips to get national distribution deals. Sam Phillips had further success with blues recordings by Little Junior Parker, Billy “The Kid” Emerson and Little Milton Campbell. He also recorded a few group recordings, his most successful was by a group of inmates at the Nashville State Penitentiary who called themselves the “Prisonaires”. Their recording of “Just Walkin’ in the Rain” (Sun 186) written by lead singer Johnny Bragg was an R&B hit and in 1956 was made into a pop hit when Johnnie Ray released a cover on Columbia Records. The Memphis Recording Service, in addition to recording bar mitzvahs, weddings and making off-the-air transcriptions for local radio stations, also recorded personal records for people walking in off the street. For four dollars they would record two songs. A young truck driver in Memphis named Elvis Presley stopped in one day on his lunch hour to record a song for his mother’s birthday. Sam Phillips was not there that day, so Marion Keisker, the Sun office manager, recorded Elvis. As Elvis sang the first song she decided to make a tape copy to play for Sam. She not only played the song for Sam Phillips, but kept pushing Sam to use the young singer. Eight months later, in 1954, when he needed a singer for a song called “Without You”, Sam called Elvis Presley into the studio. Elvis was terrible on the song, so Phillips asked him what else he could do. Elvis sang religious, gospel, western and even Dean Martin material. Elvis told Sam he was looking for a band and Sam put him in touch with Scotty Moore and Bill Black. 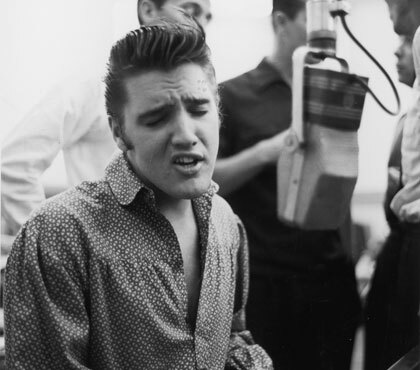 Elvis rehearsed with Scotty and Bill and then went back to the Sun studios. The first song recorded was “I Love You Because” and some other country oriented songs. During a break, Elvis, Scotty and Bill were messing around in the studio, Elvis was banging on a guitar and singing “That’s All Right, Mama” an old country blues song by Arthur “Big Boy” Crudup. When Sam Phillips heard this, he told Elvis to start over and he would record it. Sam Phillips recognized that in Elvis he had what he had been looking for, a white singer who sounded black. They knew that “That’s All Right, Mama” (Sun 209) would be the first single for Elvis Presley. During the next few days, they recorded Bill Monroe’s “Blue Moon of Kentucky” for the second side of the single. Sam took a dub of the record to Dewey Phillips, Sam’s former business partner and top DJ on WHBQ. Dewey played the song over and over, listeners called in with their enthusiastic reaction. Dewey called Elvis into the studio for an on-air interview, emphasizing that Elvis was a graduate of Humes High School. Dewey said later he wanted to get that out since many listeners thought Elvis was black and Humes was an all-white school. Sam Phillips and his artists had merged white country music with black rhythm and blues to create a new sound. Elvis made five singles for Sun records, each of them combining a blues song on one side with a country song on the other, but both sung in the same vein. Each release got more and more attention. His fourth single, “Baby Let’s Play House”/”I’m Left, You’re Right, She’s Gone” (Sun 217) made #5 on the Billboard Country and Western (disc jockey) charts and #10 on the C&W best seller charts. The fifth single, “I Forgot to Remember to Forget” (Sun 223), made it to #1 on the Country and Western charts (both juke box and best seller charts), while the flip, “Mystery Train,” made #11. Elvis’ dynamic stage shows were also creating a sensation all over the south. Elvis had a new manager named Colonel Tom Parker who wanted to take Elvis to a major record company. 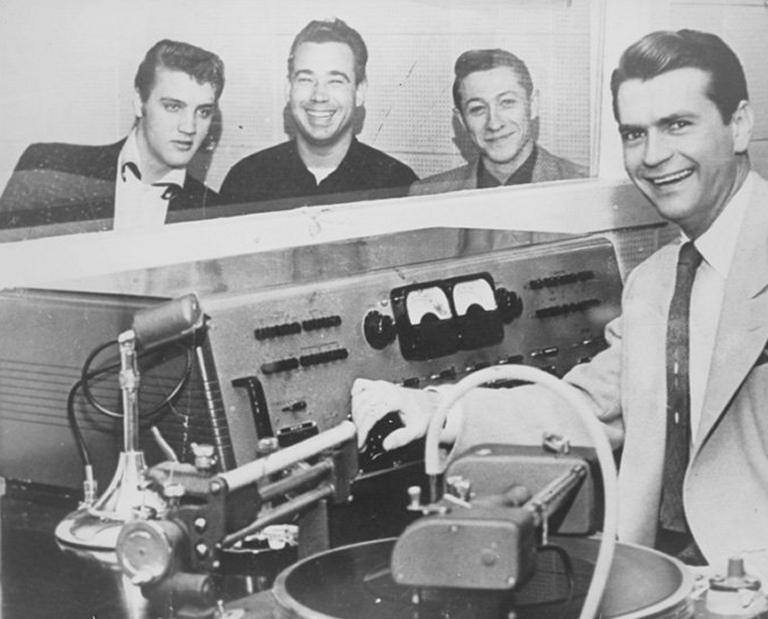 Sam Phillips knew that he couldn’t keep Elvis when his Sun contract expired, so he sold Elvis’ contract and all of Elvis Presley’s Sun recordings to RCA Victor for $40,000, split $35,000 for Sun Records and $5,000 to Elvis (which may have represented unpaid record royalties). With the success of Elvis, other young country singers were drawn to Sun Records. Among them were Carl Perkins, Johnny Cash, Jerry Lee Lewis, Roy Orbison and Charlie Rich. Sam Phillips soon abandoned blues recording and concentrated on this new music, called rockabilly, a combination of “hillbilly” (as country music was then sometimes called) and rock & roll. Sun Records produced hit after hit. Carl Perkins was on the verge of major stardom with “Blue Suede Shoes” (it reached #2 on the pop charts and #1 on the country charts, despite a cover version by the enormously popular Presley), but was involved in a serious automobile accident which left him unable to cash in on his popularity. Jerry Lee Lewis had two giant smashes in “Whole Lotta Shakin’ Goin’ On” and “Great Balls of Fire”. On a tour of England, the newspapers revealed that Lewis had married a 13 year old girl while not legally divorced from his previous wife. Lewis had to cut the tour short and come home, his career temporarily in ruins. Jerry Lee Lewis continued recording for Sun for several years but he never recovered from the bad publicly to have a hit of the magnitude of his first two. He was able to revive his career later by moving into country music on the Mercury Record label. Johnny Cash was probably the most consistent record seller on Sun but left the label for Columbia in 1958. The move to the new studio on Madison Avenue in Memphis was important for another reason. Apparently, the old studio on Union Street was for most of the years only equipped with monaural recorders. The new studio featured an upgrade to stereo machines, and the stereo material released from Sun mostly seem to have been recorded, or at least overdubbed, after the move. The original issues of the albums on Sun, Phillips International, and Judd were all mono, to our knowledge. Reissues of these albums have turned up in rechanneled stereo, but it apparently wasn’t until the late 1960s that the original tapes were dug out and some of the original stereo issued on vinyl. A recent CD on the AVI/Sun label featuring Charlie Rich’s recordings from 1959 show that Sun’s Union Avenue studios did have some stereo capability before the move, but the stereo recordings from that era are few and far between. Sun Records had become a major force, almost becoming a national label. Unfortunately, its slate of talent left the label one by one, and wasn’t replaced by artists of similar stature or talent. By 1963, Sun was pretty much back to the status of a regional label. By 1968, Sun was almost moribund, issuing very few singles. Sam Phillips had made a lot of money from the record business and even more from his other interests (he was an early investor in the Memphis based Holiday Inn hotel chain among other things). On July 1, 1969, Sam Phillips sold the Sun Record label to Shelby S. Singleton, Jr., a very successful record producer for Mercury records. Singleton recognized the value of the catalog and re-released the great Sun recordings on a series of albums on the Sun International label in the United States. He also leased the recordings to other record companies around the world. The Sun Record material is perhaps the most reissued music in the history of the record business, with the amount of record releases far exceeding the original output. Singleton mined the Sun archives extensively, including releasing stereo masters, and almost all of the unissued material in the vaults now has been released.